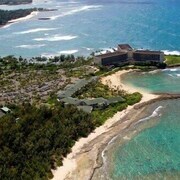 Situated by the ocean, this resort is steps from Turtle Bay Faizo Course and Turtle Bay Beach. Turtle Bay Palmer Course is 0.1 mi (0.1 km) away. 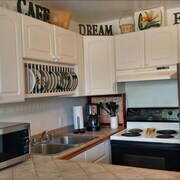 Situated in Kahuku, this condo building is steps from Turtle Bay Palmer Course and Turtle Bay Beach. Turtle Bay Faizo Course is 0.1 mi (0.1 km) away. You need not win the lottery or be sitting on a trust fund to see the world. It's time you traveled the fantastically frugal way through Kahuku! 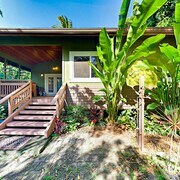 This destination is around 25 miles north of the capital of Hawaii, Honolulu. Kahuku is also 12 miles north of Wahiawa. There are around 3,000 locals that reside in this corner of Oahu. Turn your vacation's next excursion into a captivating lesson in history at the Puʻu O Mahuka Heiau State Historic Site. This free historic sight is certainly worth making the effort to see first-hand. One way to add even more amazing vibes to your journey is to chill out by the water. Just a quick drive away, Laie Falls Trail is a nice spot to get a fix of nature. Grab your headphones, hit play and go for a run on one of the region's gorgeous strips of coastline. 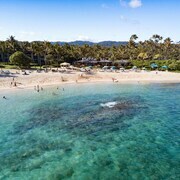 Exercising at Banzai Pipeline, Sunset Beach, Pupukea Beach Park and Waimea Bay Beach Park is cheaper than hitting the gym and far more inspiring! When you're traveling on a tight budget, spending time in Mother Nature will always be an affordable and satisfying option. Set up a picnic chair and experience her beauty for a couple of hours at Waimea Valley and Laie Point State Wayside. Don't like making compromises on quality just to save your hard-earned money? Relax, CheapTickets has your back. When you book with us, you won't have to sacrifice great amenities or spend a king's ransom. With access to 500 airlines and more than 500,000 properties globally, you can be certain that we'll offer you the thriftiest deals on the market. And it doesn't stop there! If you combine your airfare and hotel bookings, you'll save up to $481. The less money you spend the better you'll feel, and with our Price Guarantee you'll feel pretty cheerful. Here's all you need to know — we'll refund the difference if you find your vacation package for a cheaper deal within 48 hours of booking. There's nothing like the feeling of being rewarded for landing a red hot deal. Our simple rewards program allows you to earn cash to put toward your next qualifying CheapTickets hotel stay. All you need to do is book your flight! Wondering exactly how you can guarantee access to savings, special bonus offers and super-thrifty perks? Just sign up for free or log in and join the CheapCash loyalty program. It's really that easy! We know you're into all things cheap, so why not rent a car in Kahuku? It's not only a terrific way to travel around, it'll save you heaps of money too. Flying into Daniel K. Inouye International Airport? After you disembark, you can rent a car straight away. Budget is one good outlet here. Avis is also worth having a look at. 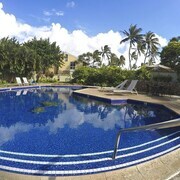 Are you planning to stay overnight in Kahuku? Get ready to make some quick decisions, cheapster. 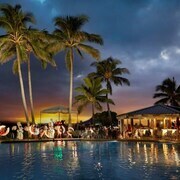 Presently, CheapTickets lists only 7 hotels in Kahuku. 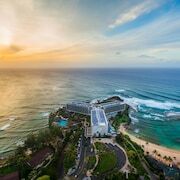 Your booking options on the island include the Turtle Bay Resort and Courtyard by Marriott Oahu North Shore. Find out about the facilities and then choose your favorite.